The magnesium body and rotor on the Supreme are extremely lightweight and durable, and they'll virtually eliminate stress from torque when fighting big fish. This is Pflueger's flagship freshwater spinning reel, smooth and responsive, with all the features you'd expect in a top-shelf performer. Equipped with 9 stainless-steel ball bearings, instant-stop one-way clutch, and a machined, double anodized aluminum spool. Sure-Click bail, anti-twist titanium line roller, and machined-aluminum handle. FREE aluminum spare spool and drawstring storage bag. "Pflueger Supreme-Do yourself a favor and match it with a quality rod. I use a 6'0 GL2 for bass fishing." "I'm a young fisherman, but I've been fishing since I was a little kid. I've been through many reels in my day, this one is by far my favorite. The drag is perfect and the retrieve is extremely smooth." "I have a quantum pt's, Shimano sahara's, saros, etc. Only brand I can't speak about is Daiwa, and this Supreme is by far my favorite. I bought it in Feb 2008, fished it for a year, and love it." "This reel is Super smooth. I have had no problems out of it. I own 2 other Pflueger reels, no problems with either of them. 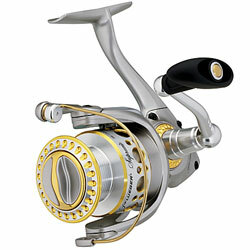 But this reel has to be the BEST spinning reel I have ever fished with."